You don’t hear of Jews blowing up giant Buddhas. It’s not as though their sacred texts don’t rail against such graven images. In fact, we invented idol smashing. You remember. It was Abraham, the founder of those so-called monotheistic religions who, when left alone in his father’s idol shop, slashed inventory. 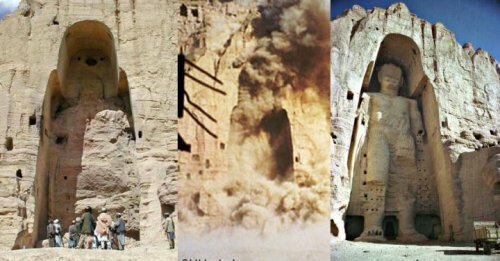 3rd -4th century A.D, 37 meter high,(Shakyamuni) Buddha demolished by Taliban with 50,000 kilograms dynamite on March 12, 2001 in Karachi, Afghanistan. The midrash is so well known that most Hebrew-School graduates think it’s part of scripture and not simply a literary fiction of the Midrash (B’reishit Rabbah 38:13). The Midrash is so well known that it appears in the Quran (Qur’an 21:51-70). Both renderings have Abraham leaving the largest idol untouched to support his claim that “the big guy did it”. (see comparison of the midrash and Quranic accounts here). So why don’t Jews smash idols? It may also be that Jews don’t believe that these images represent real idols and correspondingly, that Jews don’t believe that worship as practiced by Buddhists, Hindus, Taoists etc, corresponds to the idol worship portrayed in the Bible. This last approach is the one offered by Classical Rabbinic texts. The Talmud (Sanhedrin 102b) which argues that the idolatry referenced in the Bible had a force and efficacy that no longer exists and which we moderns have no way of comprehending. 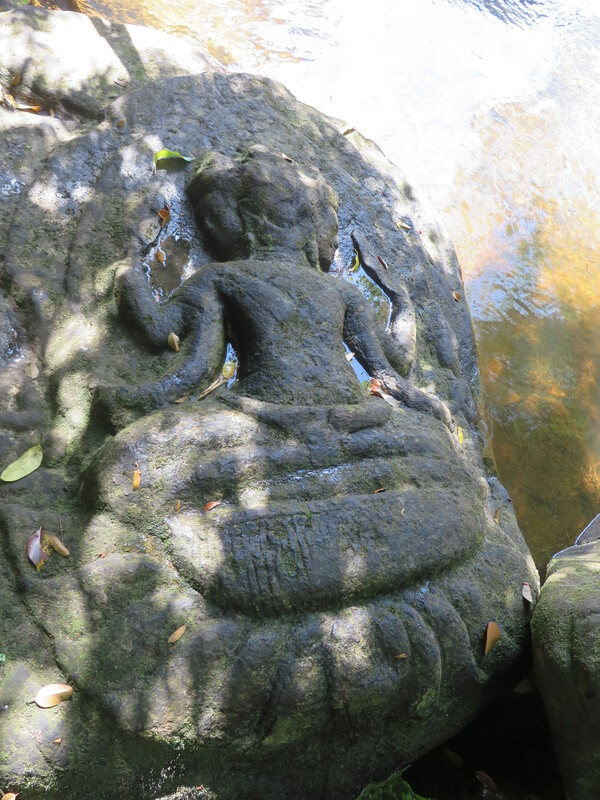 “The drive for idolatry was so strong in my [ancient] time that, had you been there, you yourself would have caught up the skirt of your garment and done the same!” (see) Mosts Buddhists and Hindus will tell you that they are worshiping the spirit through the lens of a visual image. So why don’t Jews blow up Buddhas? Is it because they have more pressing matters? Is it because we would prefer not to antagonize billions of believers? Is it because the worship of images of Buddha, Brahma, Vishnu, Shiva, etc do not constitute the Idol worship of ancient Old Testament times? Or, is it because we actually don’t take our monotheism that seriously? Let’s face it, Jews (and Christians, for that matter) may wail against graven images, but whether it be widespread reference to God’s human features (outstretched arms, face, image etc.) and emotions (anger, jealousy etc) or calling the Godhead by different names (as in El, Yahweh, Shadai, or respectively; Father, Son, or Holy Ghost).. there are plenty of images in our texts and liturgy to go around. I admit that in our daily speech, we Jews don’t refer to God by any of His given names. We use a moniker: “Hashem” in the daily vernacular, but by the familial way we use it, you’d think that “Hashem” was a Jew’s best friend. If you want to take the no-name approach seriously, you should follow our Abrahamic brothers and sisters in Islam. Muslims do not use “Allah” the way Jews use the “Hashem”, in fact proper muslim practices suggests that one should use the word “Allah” only when speaking Arabic. When one speaks English one should use the word “God”. “Allah” is simply the Arabic word for “God”.. not the name of the Muslim God. It is surprising to notice that many Muslims do not realise that the word “Allah” is simply the Arabic word for the word “God”. Many of them believe that “Allah” is the actual name of the Muslim God! They do not realise that it is wrong to “personalise” God as He is not a person. God is much greater than to be confined to a single name. Neither do they realise that the word “Allah” does not belong exclusively to the Muslims and that it has always been used before (and after) the revelation of the Quran by the Arabic-speaking Jews and Christians when they speak about God. So if we Jews took our no-name approach more seriously, we would say “The Name” instead of “Hashem” when speaking English.. But let’s face it “Hashem” is so much more personal and Haimish. So let’s be real…. we Jews don’t take our Monotheism that seriously… Baruch Hashem. Our’s is a monotheism, full of anthropomorphisms and warmth. It is what I like to call “Monotheism with a wink”. As the author of a book on the Big Ideas responded when asked by a NY Times reporter what was the single worst idea in history? Monotheism with a wink supports a radical pluralism of opinions and interpretations. Max and Isaac come to the Rabbi’s study to settle a dispute. The Rabbi’s wife is also seated in the room. Monotheism without a wink is a most dangerous thing. But monotheism with a wink leads to humor, caricature, satire, curiosity, experimentation, innovation, invention, accommodation, conciliation, compassion, compromise and probably mixed dancing… and Baruch Hashem for that. May the memory of those killed in the name of a monotheism without a wink, be forever a blessing. There is an impressive and seamless continuity between texts, mythologies, art, ritual objects, and architecture within Hinduism and Buddhism. A perfect example is the lotus. In mythology and sacred Hindu texts the lotus grows from the navel of Vishnu, the sleeping god whose dream is the universe. 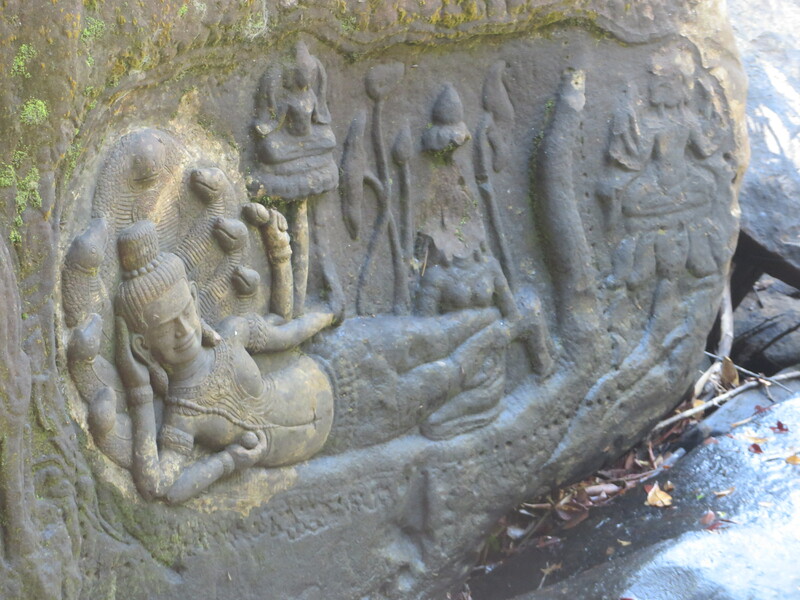 Brahma sits on the lotus, the symbol of divine energy and divine grace. 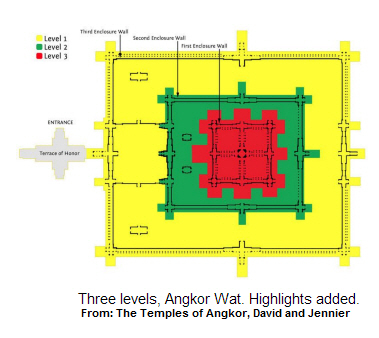 In fact, the design of the Temples at Angkar follows the pattern of the lotus flower (un-open) emerging from a base representing the lotus petals. 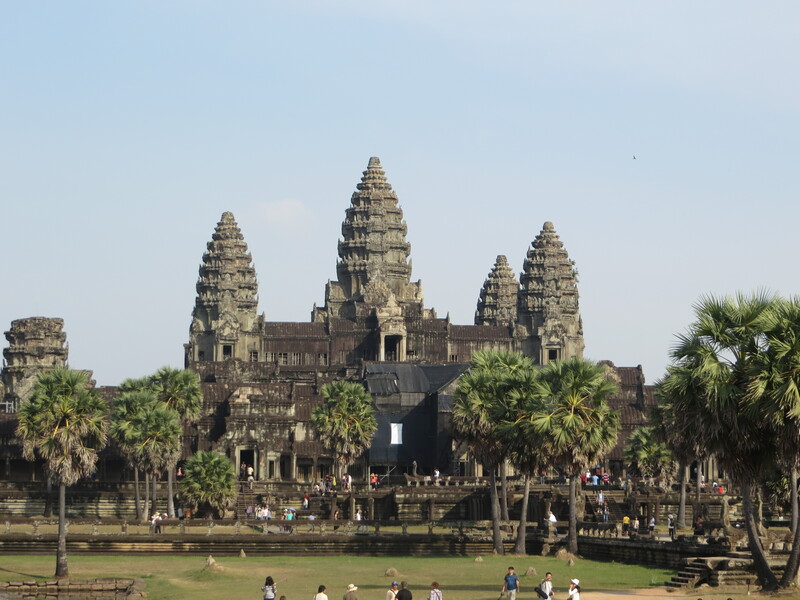 The complex Angkor Wat with it’s central lotus surrounded by four lotuses is no exception. At its core the image of the lotus plant arising from the navel and the flowering of the lotus is the essence of creation and sexual in nature. The phallic nature of the temples at Angkar are oblivious. 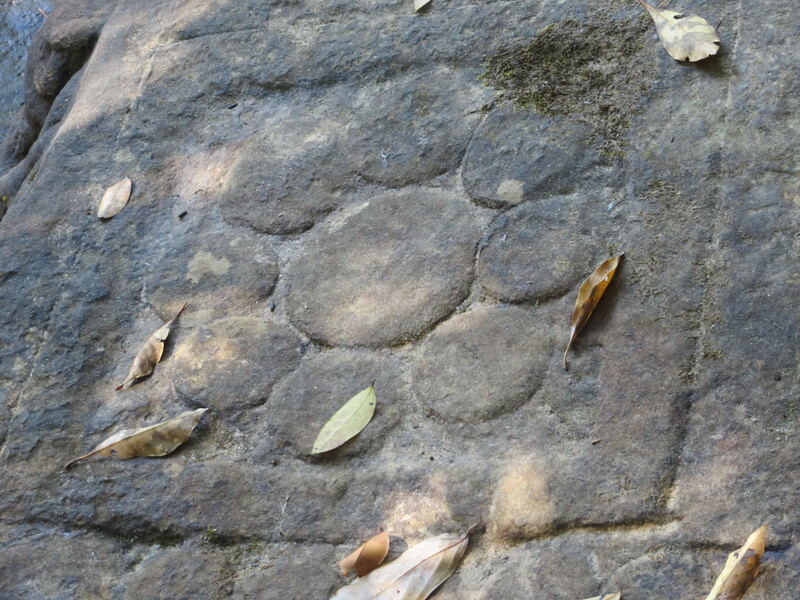 In its most minimalistic form the lotus flower/petal motif takes the shape of the linga and includes the mountain iconography most noticeable in the structure of the Angkar temples. The lingam is often represented alongside the Yoni, a symbol of the goddess or of Shakti, female creative energy. The yoni is the creative power of nature and represents the goddess Shakti. 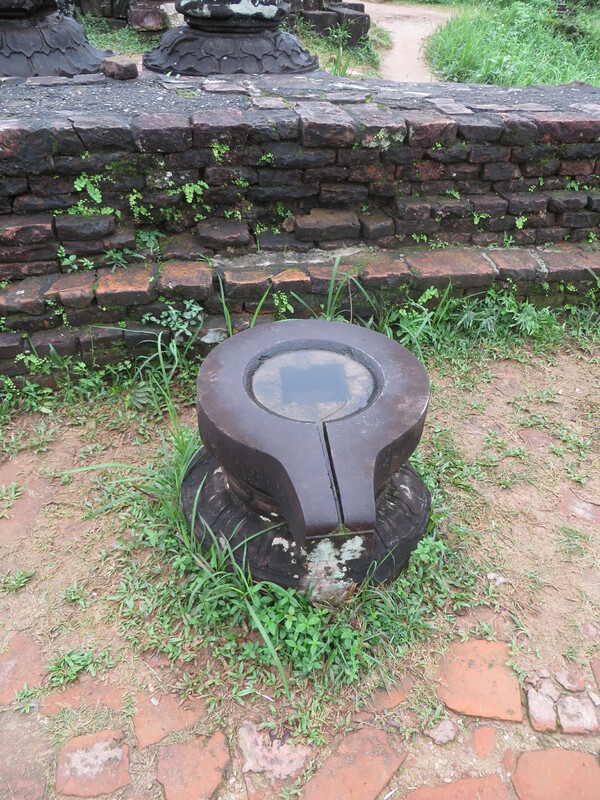 The linga stone represents Shiva, and is usually placed in the yoni. The lingam is the transcendental source of all that exists. The linga united with the yoni represents the nonduality of immanent reality and transcendental potentiality. The Yoni represents the petals out of which the Linga emerges and rests and more ancient specimens from matrilineal societies are square, while later versions, have their power reduced by rounding. 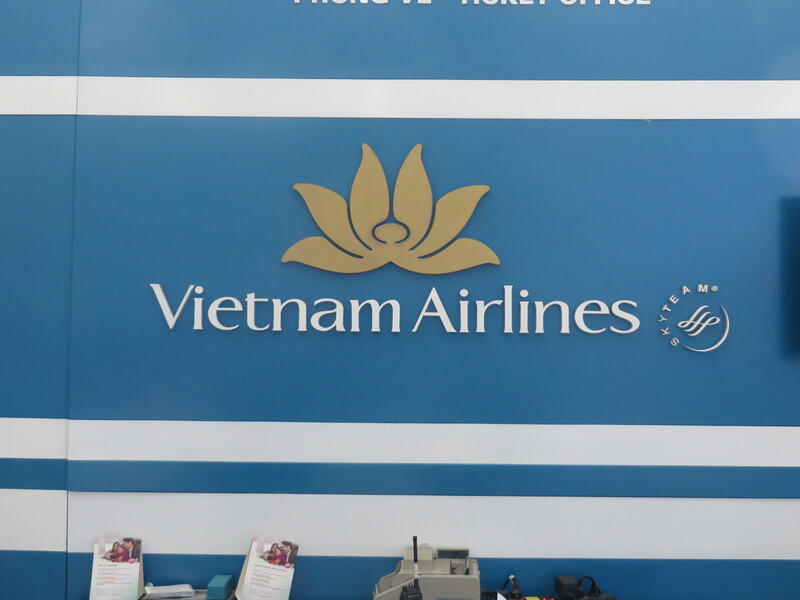 In fact this combination of Famale petals and male lotus flower is the brand of Buddhism and I might add, a lot of Cambodian and Vietnamese companies. 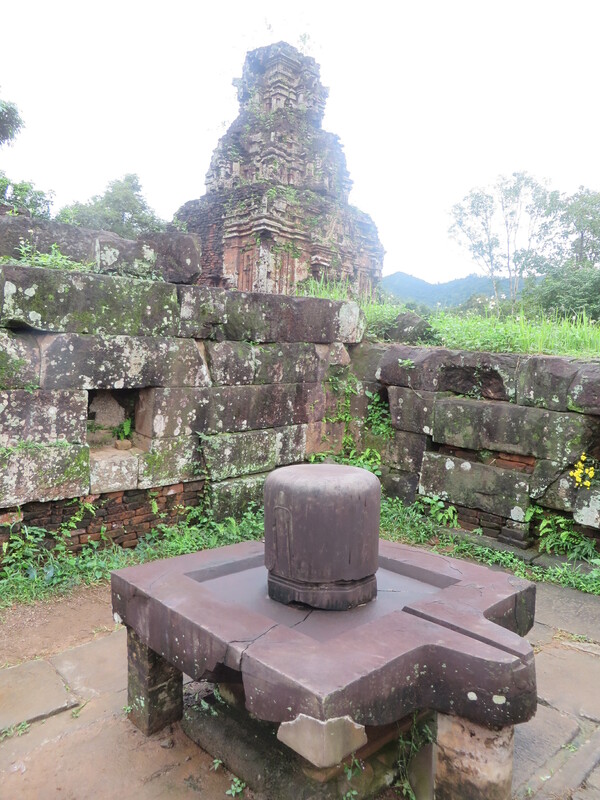 This brand is called the Linga and nowhere more apparent than at the River of A Thousand Lingas a 40 minute drive from the temples at Angkor. So I get it. Judaism does not condone images. It hardly has a brand mark. Unlike the menorah, the Lion of Judah, the shofar and the lulav (our lotus? ), the Star of David, considered by most to be the Trademark of Judaism, was never a uniquely Jewish symbol.” Our ancient art is limited and mostly derivative of other pagan cultures in the neighborhood (see: signs of the Zodiac). But certainly there must be some iconography which a tour guide of Judaism could point out. Are there primal and seminal shapes and messages hidden in our texts and rituals, that we just ignore or have left buried under the surface? I have always been intrigued by the ambiguous relationship of the Hebrew Bible to corners and squares. The word in Classical and Modern Hebrew for square is ribu’a (ריבוע) which really just comes from the word 4. This word, along with the word for Circle (עיגול) do not to my knowledge appear in the ancient biblical texts. Geometry was not the Bible’s favorite subject… But we do have the word for corner “Payah” (פֵּאָה) which not only appears, but appears to play an important role. Keeping the “corners” of the beard is the source for Jewish beards and side curls.. called Payot (corners). who shall spread out their wings on high, screening the ark-cover with their wings, …. It is tempting to suggest a connection between wings/corners and the Hebrew creation myth which begins by God fluttering (rä·khaf’) over the abyss. and the spirit of God was hovering: The Throne of Glory was suspended in the air and hovered over the face of the water with the breath of the mouth of the Holy One, blessed be He and with His word, like a dove, which hovers over the nest, acoveter in Old French, to cover, hover over. He encompassed them: [Rendered by Onkelos :] “He made them encamp round about His Divine Presence”-the Tent of Meeting [where the Divine Presence rested] was in the middle [of the camp] and the four divisions [i.e., the tribal camps, surrounded it] from all four directions. Not only does the hovering wings motif include the trifecta of Creation, Exodus and Revelation, but according to the sources that Rashi references, the Biblical hovering “kenafim” wings is a four cornered force field of tenderness and protection. 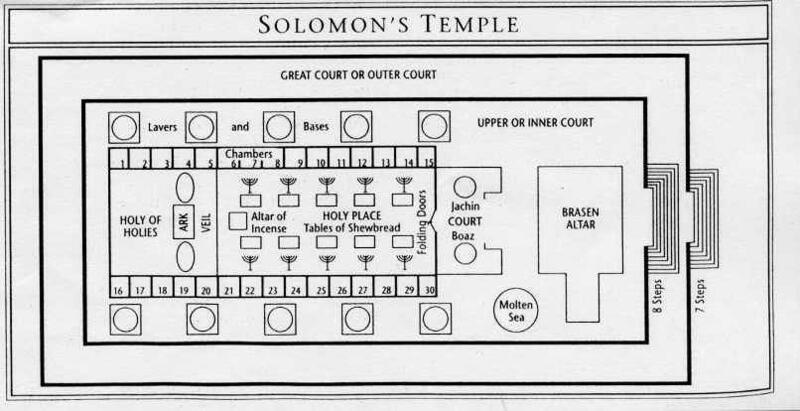 If we are discussing holy squares and rectangles, we need to mention the Mishkan – Tabernacle (מִשְׁכַּן) and the Beit HaMikdash – Temple (בֵּית־הַמִּקְדָּשׁ ) which, like Hindu and Buddhist temples was to be situated on the top of a hill/mount (הַר הַבַּיִת). The shape of both were rectangular. Of interest for our discussion is that the word used for side is actually our friend corner-Peyah. In addition to corner, Peyah can also mean extremity, edge or border. for the southern side: Heb. לִפְאַתנֶגְבָּה ךְתֵּימָנָה. [The word לִפְאַת is derived from פֵּאָה, which usually means “corner.”] This [use of the word] פֵּאָה is not an expression meaning “corner,” rather the whole side is referred to as פֵּאָה, as the Targum [Onkelos] renders: לְרוּחַ עֵיבַר דָרוֹמָא, to the side toward the south. 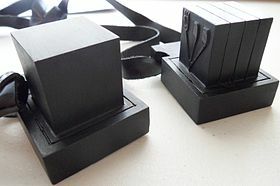 Whenever I have thought about a context for odd shape of tefillin I have always thought of the Kaaba in Mecca  … not only because they look so similar, but also because the tefillin are also referred to as a Bayit or house… or Battim in the plural. Since the Jewish temple is also referred to as a Bayit, (as in Beit HaMikdash and Har HaBayit), it seemed to me natural to think of it as a miniature temple and to look to our rectangular temple for context. Fortunately, I am not the only one who has thought of this comparison. Granted that he shows a traditional tefillin box and not uncovered tefilin, but I think his visual comparison is well taken. It may even be that on each of the three Pilgrim festivals, ancient Jews ascended to the temple and completed their pilgrimage, by circling the square Temple. 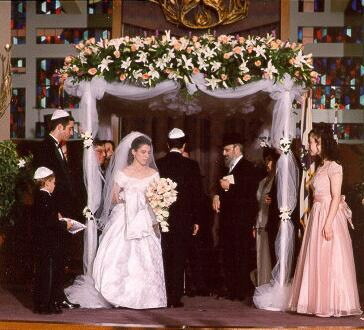 Think also of a bride circling the groom under the square wedding canopy (Chuppah). This post is more of a question than a statement. It is more of a request for further comment and research. But certainly students of Judaism need to explore this interest in sanctifying the corner. 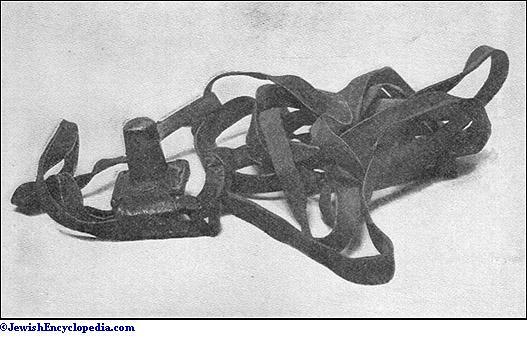 The first texts to use “tefillin” are the Targumim and Peshitta and it is also used in subsequent Talmudic literature, although the word “ṭoṭafah” was still current, being used with the meaning of “frontlet.” “Tefillin” may have derived from the Aramaic palal, “to plead, pray,” a word closely related to the Hebrew tefillah, “prayer.” Jacob ben Asher (14th century) suggests that “tefillin” is derived from the Hebrew pelilah, “justice, evidence,” for tefillin act as a sign and proof of God’s presence among the Jewish people. [2a] Interesting to note that the Jews are identified by two square shaped “cornered” wearable objects… the Talit and the Tefillin. This charge of the demonstrative nature of the commandment is, in fact, confirmed by the rabbis, who interpret the verse “and all the peoples of the earth shall see that the name of the Lord is called upon thee” (Deut. 28:10) to refer to “the tefillin of the head” (Ber. 6a). (see Encyclopedia Judaica Tefilin). Imagine a Jew walking by wearing talit, tefillin and sporting a beard and/or payos… that would make three sanctified squares all identifying the individual as a Jew! The Arabic word Kaaba comes from the Arabic ka’bah meaning “square house,” which in turn comes from ka’b meaning “cube.”… According to tradition the Kaaba was built by Ibrahim (Abraham). It is stated in the Qur’an that this was the first house that was built for humanity to worship Allah (God). In her book, Islam: A Short History, Karen Armstrong asserts that the Kaaba was at some point dedicated to Hubal, a Nabatean deity, and contained 360 idols that probably represented the days of the year. In Guillaume’s translation of Ibn Ishaq, an early biographer of Muhammad, the Ka’aba itself was addressed using a feminine grammatical form. 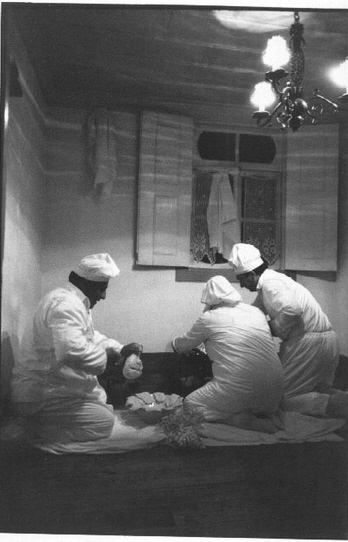 Circumambulation was often performed naked by men and almost naked by women, and linked to ancient fertility rites. 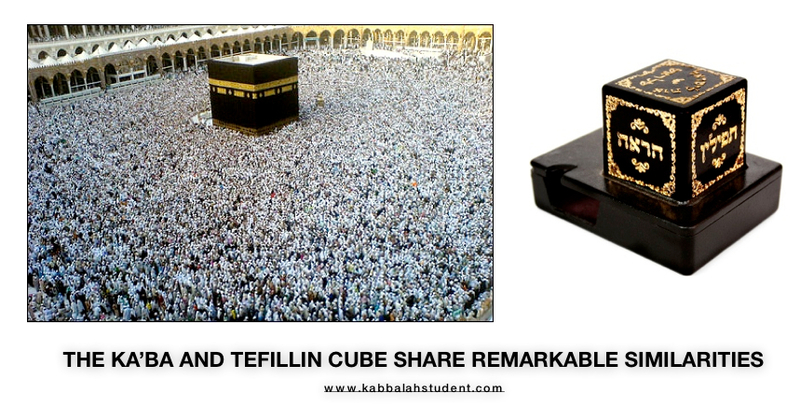 Also of interest, is that reference is not made to the four sides of this cube, but rather to its four corners: Corner of the Black Stone (East), Corner of Yemen (South-West). Corner of Syria (North-West). Corner of Iraq (North-East). When I walk down a city street, find myself in a crowd, an over-filled subway car or visit a foreign land…. my favorite activity is not people watching, but face watching. There’s nothing like looking at the face of a stranger. I am drawn to the fact that I have never, and most likely never will again… see that face. I am fascinated by the infinite diversity. I imagine a story, background and trajectory of each face I view. If there is a G/god, and if S/he creates every human being then the infinite variation of our face is the only proof I need. “in the form that was made for him” literally means with a [printing] press that was [specifically ] made for him [each individual wo/man] or a one-off die. God’s printing press was the first on-demand digital press where every image was unique. Although it doesn’t specifically say it, the metaphor of the coin-press conjures up the image of the “heads’ side of the coin. I have always assumed that what makes each wo/man unique was first and foremost their face. If Jews have an image of nirvana or dharma where a human achieves oneness with the godhead, it is in Moses who sees God “face to face”. The one molten image permitted, nay commanded by Biblical law (Exodus 25: 18) was the two golden cherubimּ facing each other on top of the ark of the covenant…. According to Rashi, the face of the cherubim was the face of an innocent child. That image (דמות) that is referred to relates to the face (פרצוף) of a child. As for the likeness of their faces, they had the face of a man; and they four had the face of a lion on the right side; and they four had the face of an ox on the left side; they four had also the face of an eagle. Thus were their faces; and their wings were stretched upward; two wings of every one were joined one to another, and two covered their bodies. It is in the face that both the mystics and doubters can find God. As seen in Ezekiel, it was not beyond ancient and classical Jewish thinkers to put an animal’s face on a divine or human being. After all… the Hebrew word for face “panim” is found only in the plural… no being (divine, human or animal) has only one face. While the Rabbis of the Mishnah and Talmud did not count years as the Chinese do, with animals, it was not beyond them to characterize a generation or age with the face of an animal. (בן מנוול אב בת קמה באמה כלה בחמותה אויבי איש אנשי ביתו פני הדור כפני הכלב הבן אינו מתבייש מאביו ועל מי יש לנו להשען על אבינו שבשמים” -מסכת סוטה, פרק ט’, משנה ט”ו. In latter Jewish tradition, it was a new face (פנים חדשות) that is required in order to have the quorum necessary to bless a newlywed couple. תנו רבנן: “מברכים ברכת חתנים [“שבע ברכות”] בעשרה כל שבעה. אמר רב, והוא שבאו פנים חדשות“. It was coming form this context that I was able, nay driven to connect to the many faces of god that I have seen in the Far East. 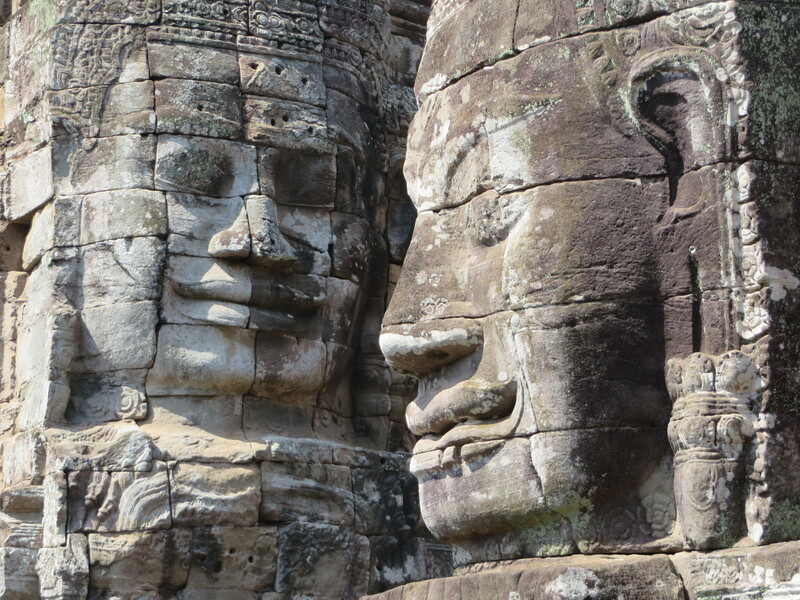 Nowhere was this more powerful than at the Face towers at Bayon temple at Angkor in Cambodia. 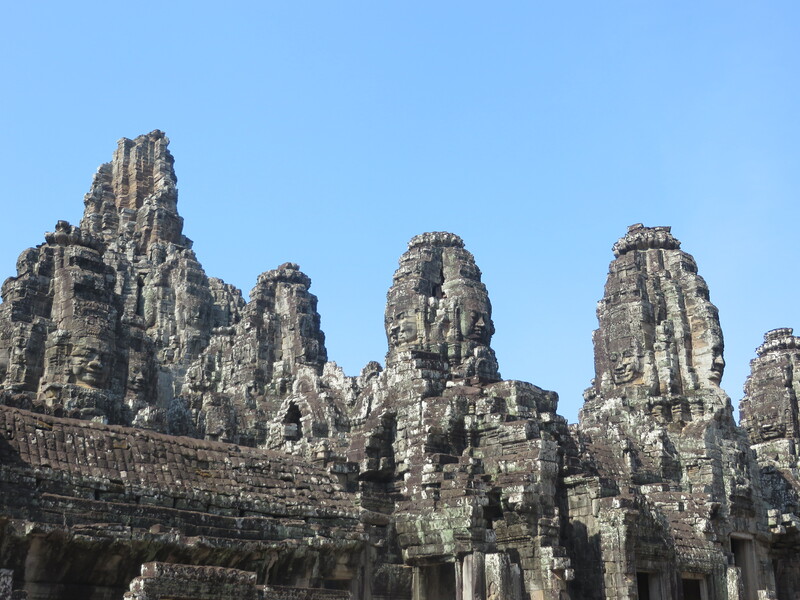 The Bayon Temple, constructed in the late 12th – early 13th centuries stands at the near-exact center of the Angkor Thom complex. Symbolically, it represents the center of the universe, the point at which the worlds of the divine and living intersect. The decorations in this temple, as in all the other temples at Angkor have undergone significant alterations over its history. The original decoration was Mahayana Buddhist, consistent with the original builder-king’s; Javayarman VII’s beliefs. 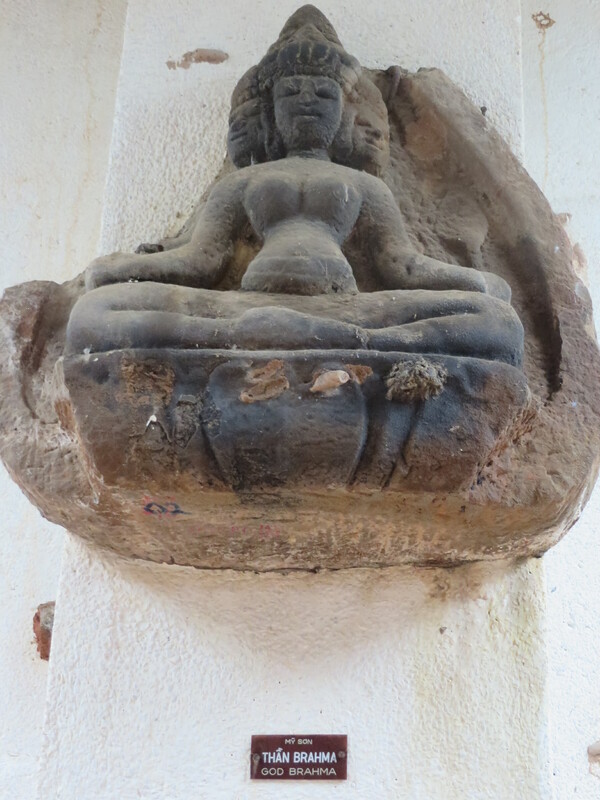 Decoration was then altered to meet Vaishnavite Hindu religious requirements. As part of this scheme, all of the temple’s Buddhas were converted into rishis (Hindu ascetics) and Shiva lingas. 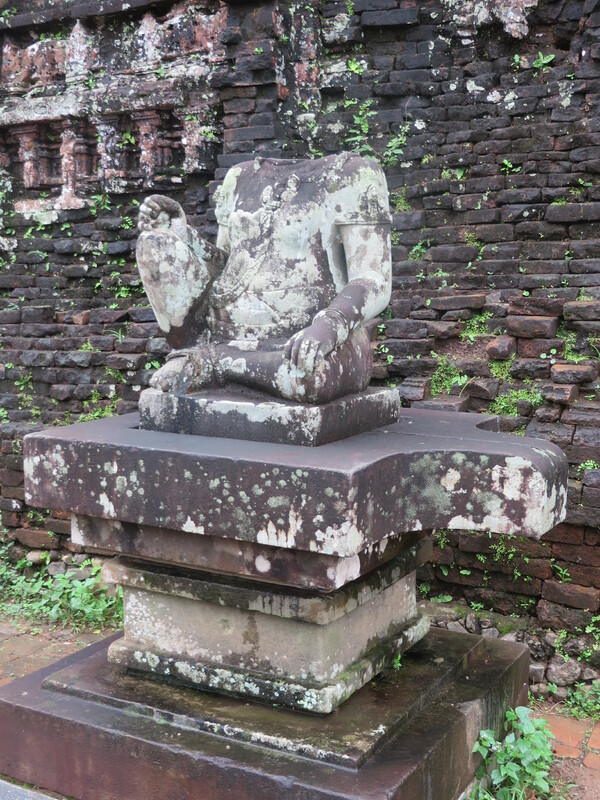 Decorative elements were given a Buddhist makeover in the 16th century to suit the new requirements of Theravada Buddhism, which prevails in Cambodia today. 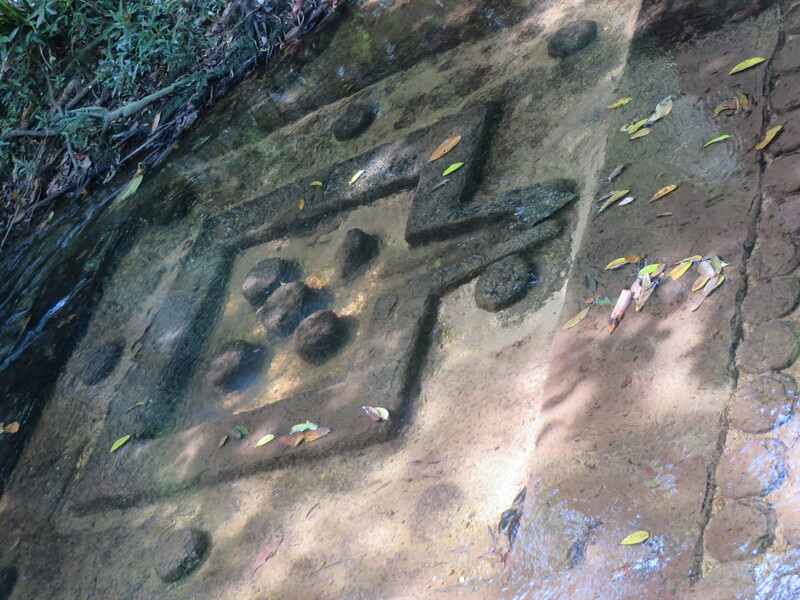 As you might expect, the Buddhists similarly scratched out the rishis and lingas. 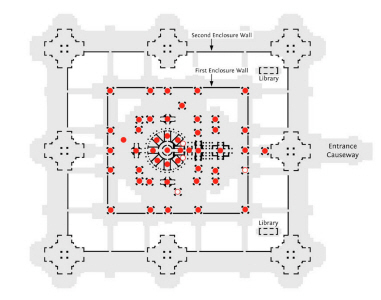 The positions of these face towers are shown with red highlights; those that are missing or destroyed are shown with white highlights. Their position emphasizes the cardinal four directions. Open eyes. 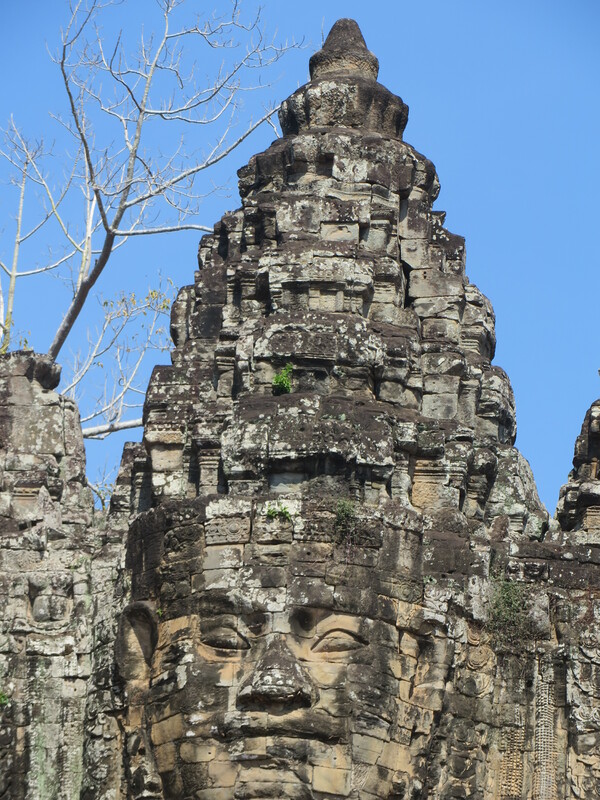 Unlike many of Jayavarman’s earlier Buddhas who have downward-looking eyes, with lids that cover most of the pupil, the eyes on the Bayon’s faces are wide open and look directly outward. Headband. Interestingly, the ornate floral headband lacks an image of Amitabha, which would have immediately identified the image as being that of Avalokitesvara, the bodhisattva of compassion; this has not stopped the image from being identified as such, however. 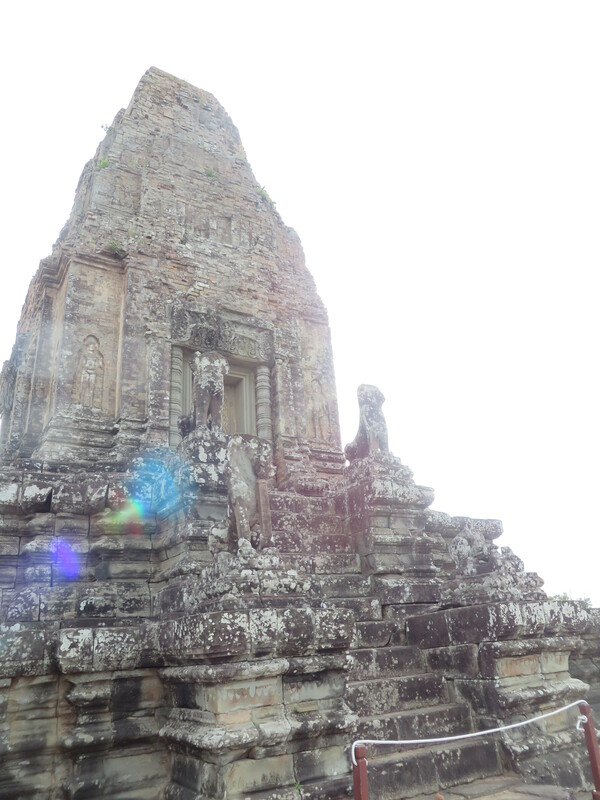 According to my guide book (which I have quoted extensively and italicized: Cambodia Revealed: The Temples of Angkor,David Raezer; Jennifer Raezer (2014-08-11) While there is historical precedent for temple towers with images (even faces) pointed in the cardinal directions, there is something that makes Bayon’s face towers entirely unique. Similar four-faced images in other parts of the Hindu-Buddhist world are enclosed within frames, recreating the concept of an all-knowing god in his mountain home, the temple. 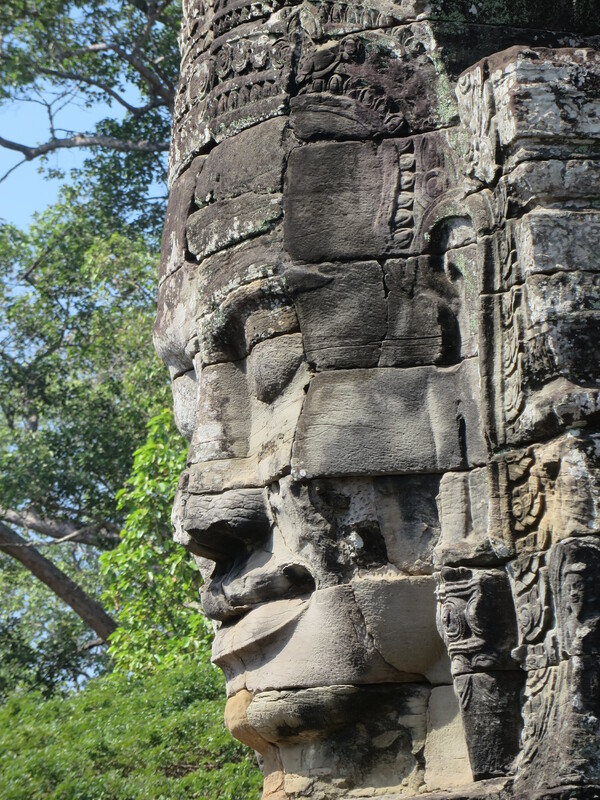 This changes profoundly at the Bayon: the absence of a frame around the face has a powerful effect of personalizing the structure by blending sculpture with architecture. 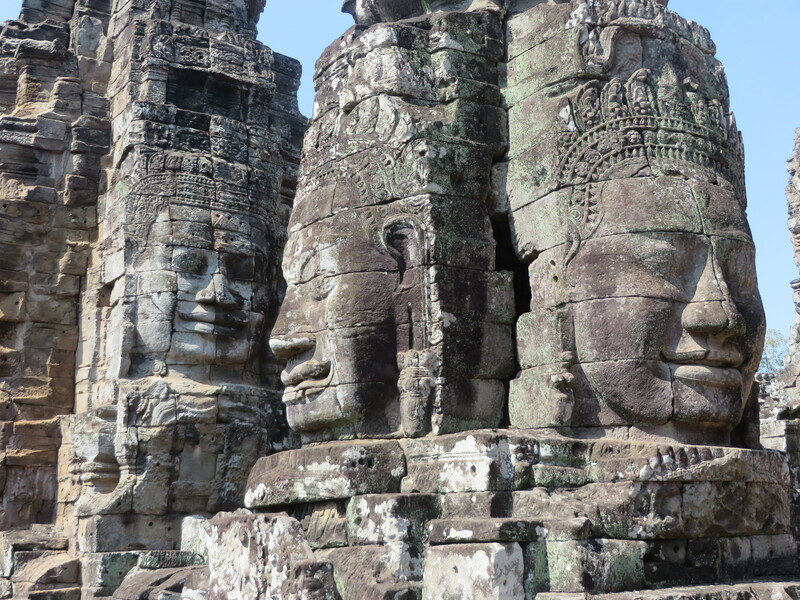 At the Bayon, the temple is no longer just the residence of the god, but rather the god itself, a god with 200 faces. Perhaps what spared the faces the desecration suffered by other Buddhist icons at the hands of Jayavarman VIII was their enigmatic identity: what might have been viewed as the face of a Buddhist figure under Jayavarman VII (Avalokitesvara or Vairocana) could easily be reassociated with a Hindu figure under Jayavarman VIII (Brahma or Sadashiva). What has always fascinated me about sculptures and paintings of God and gods is the fact that human models were undoubtedly used. 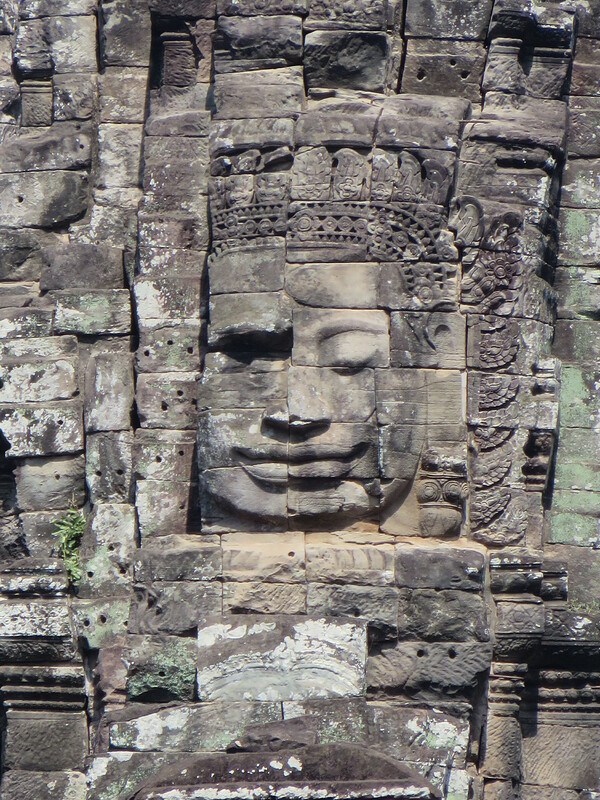 In the case of the Bayon faces, scholars speculate that the face is perhaps a portrait of the builder-king himself, Jayavarman VII, assuming the form of Avalokitesvara. If this is the correct interpretation, Jayarvarman is positioning himself as the compassionate gateway to the divine. 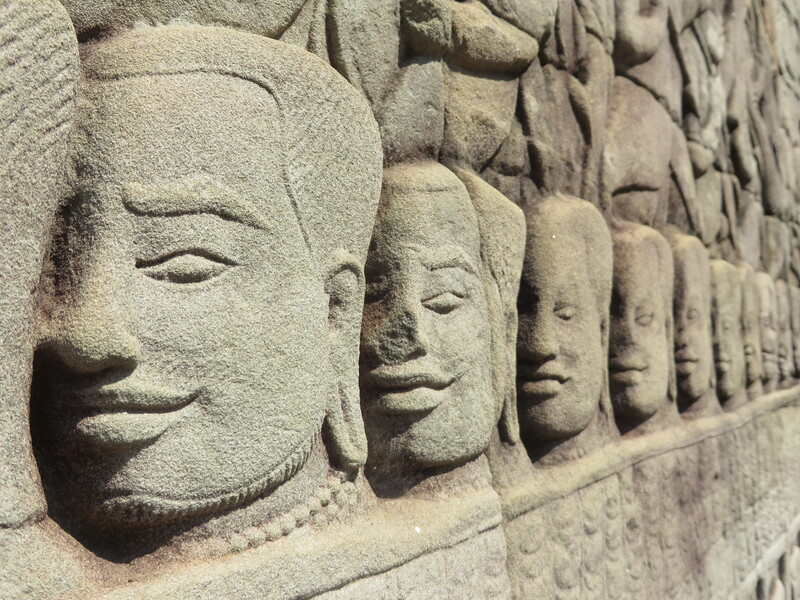 The other intriguing aspect of the Bayon is that relief sculptures throughout the temple are exclusively secular in nature with an emphasis on everyday life. 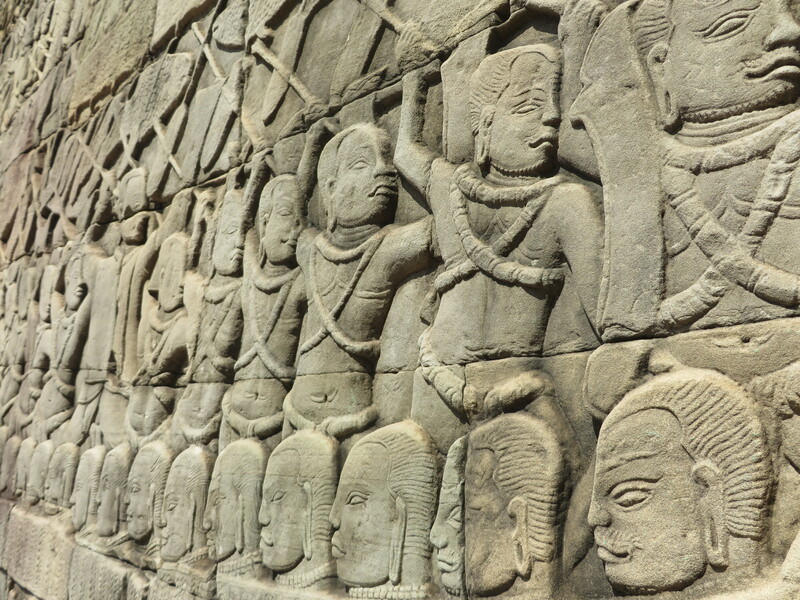 There are more scenes depicting everyday life and historical events at the Bayon ; this compares versus a focus on mythological stories, largely from the Hindu epics, at the more famous Angkor Wat. Of course, the most engaging element of so many of these faces…. is the smile, and that face of Cambodian (Khmer) culture, and their image of the divine, is irrepressible and survives even unto today. There’s a story of two Hasidic rebbes sitting in a sukkah. In answer to the question of “what’s your favorite mitzvah?”, one rebbe replied that the Sukkah was his favorite commandment, because when you sit in a sukkah, you are surrounded on all sides by the holiness of the commandment. The other rebbe preferred the Sabbath. “You can walk out of a sukkah, but you can’t walk out of the holiness of the Shabbat.” said he. When hearing this story, I am reminded of Abraham Joshua Heschel ‘s insight that Shabbat is a “cathedral in time”. The Sabbaths are our great cathedrals; and our Holy of Holies is a shrine that neither the Romans nor the Germans were able to burn, a shrine that even apostasy cannot easily obliterate: the Day of Atonement. According to the ancient rabbis, it is not the observance of the Day of Atonement, but the Day itself, the “essence of the Day,” which, with man’s repentance, atones for the sins of man. Now what was the first holy object in the history of the world? … “And God blessed the seventh day and made it holy.” There is no reference in the record of creation to any object in space that would be endowed with the quality of holiness. …. it seems as if to the Bible it is holiness in time, the Sabbath, which comes first. But here’s my question… what was the response of the first rebbe? Did he fold his hands and agree that the holiness of time trumps the holiness of things? And what about our cathedrals, our homes, our homelands and our things… can their holiness transcend or at least engage the holiness of time? It seems to me that while you can’t walk out of the Sabbath, it’s holiness cannot be sustained indefinitely…. When the stars come out, the sabbath is over. You can walk out of the sukkah, but it embodies a holiness that can be sustained.. at least through the complete cycle of a week. 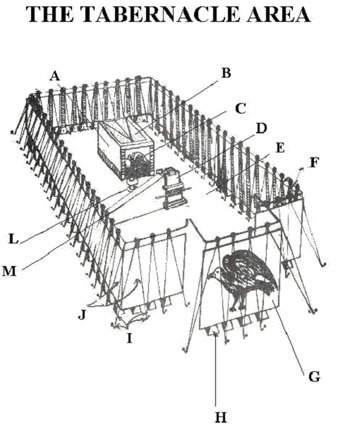 And I wonder whether “the Sukkah that has fallen סֻכַּת הַנֹּפֶלֶת is best translated as the tabernacle that has fallen, or whether it is the Fallingsukkah. (compare Frank Loyd Wright’s Fallingwater). It seems to me that David’s Fallingsukkah is always in flux and engaged in a permanent dialectic between continuity and renewal, sustainability and disruption. The Jewish Cathedral is a temporary structure, which by definition, can never be permanently destroyed nor can it achieve the stasis of permanence. The Fallingsukkah informs the way we relate with the world of the physical. The Fallingsukkah and it’s notion of holiness of things, continues the discussion begun by the notion of the holiness of time that Heschel began. 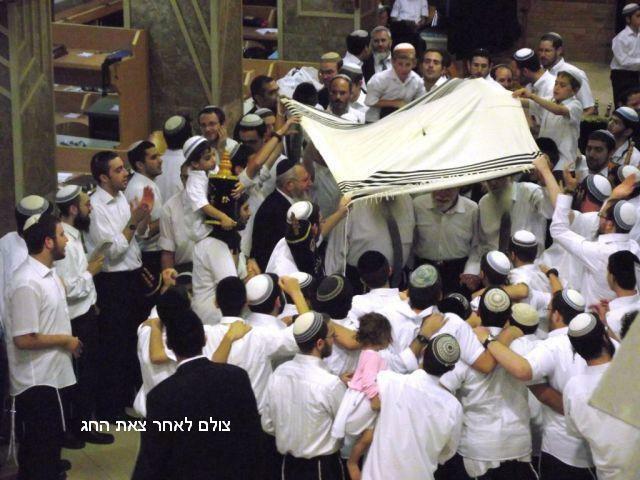 Ultimately, it is the Fallingsukkah which represents to culmination of theJwish New Year’s penitential season. From the first day of Ellul until the last day of Sukkot we read Psalm 27 every day. It would seem that the choice of this Psalmֹ of David addresses the tension between permanently dwelling in the house of God and being just a transient visitor, the dichotomy of taking refuge upon a rock or in a tent. So it comes as a surprise that of all the ordinances in the Torah, the only one that God offers a second chance at a more convenient time, is Passover. דַּבֵּר אֶל-בְּנֵי יִשְׂרָאֵל, לֵאמֹר: אִישׁ אִישׁ כִּי-יִהְיֶה-טָמֵא לָנֶפֶשׁ אוֹ בְדֶרֶךְ רְחֹקָה לָכֶם, אוֹ לְדֹרֹתֵיכֶם, וְעָשָׂה פֶסַח, לַיהוָה. בַּחֹדֶשׁ הַשֵּׁנִי בְּאַרְבָּעָה עָשָׂר יוֹם, בֵּין הָעַרְבַּיִם–יַעֲשׂוּ אֹתוֹ: עַל-מַצּוֹת וּמְרֹרִים, יֹאכְלֻהוּ. This make-up holiday is called Pesach Sheni (The Second Passover) and it intrigues me. You see, the Passover Seder is the one holiday when we are asked to not only observe, but to re-enact and imagine we are actually experiencing the Exodus. As the Hagadah says: “In Every Generation One Must Look Upon Himself as if He Personally Has Come Out of Egypt” Mordecai Kaplan said there are three kind of believers: Believers, Non-Believers and Make-Believers…. at the Traditional Seder, we are all make-believers. This is why this make-up seder intrigues me so. In the second month, at the Second Pesach Sheni Seder, we are make-believers who make-believe that we are at a Seder… making believe that we are leaving Egypt! To be sure… the Rabbis probably had their fill with Jews who make-believe so they did not want to encourage a new movement of Jews who make believe that they make believe so….. they limited Pesach Sheni to individuals. (Talmud Pesachim 66b from אִישׁ אִיש). There are groups that nonetheless celebrate the Second Passover, the most prominent being the Chabad Hasidim who view the 14th of the month of Iyar as a celebration of second chances. This is certainly a valuable lesson worth commemorating, but my good friend Frederic Brenner discovered another group who celebrated the dialectic of Pesach Sheni that is less known and embodies a more complex message. Frederic is currently completing an ambitious project where he invited world renowned photogrpahers to come to Israel for the first time and photograph it. The project which will begin touring the world is called This Place and you can read early reviews here. 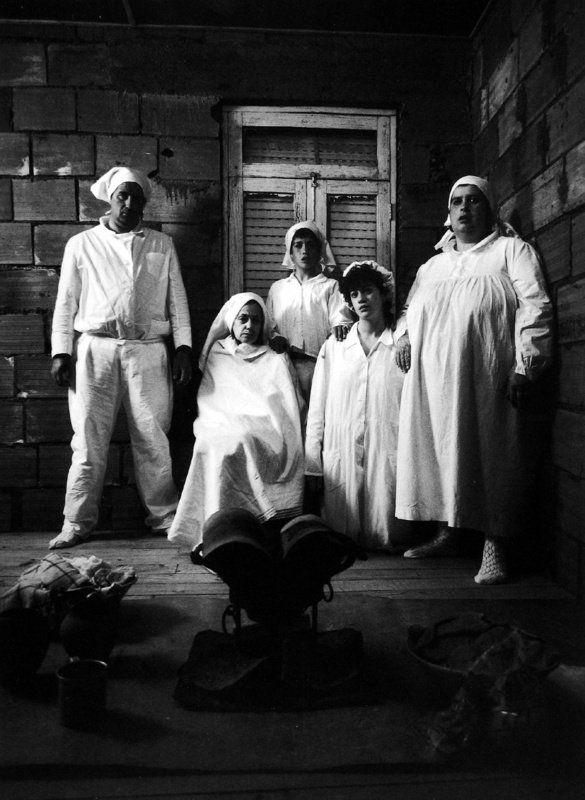 But in his younger years, Frederic traveled the world photographing vanishing Jewish communities and one community he cataloged were a group of isolated Conversos in Portugal. He published a book called Marranes (in French) and a movie was made based on the book called The Last Marranos Les derniers Marranes. 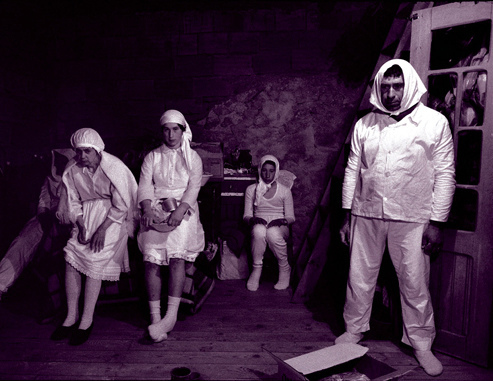 Frederic took many pictures of them celebrating Passover which, they celebrated on the 14th of Iyar, Pesach Sheni. Frederic spent much time with them and even made the aquantance of the local priest who complained that while he liked these people, they should really get themselves a Rabbi. Needless to say, they did eventually get themselves a traditional Rabbi. They no longer go to the Priest to get married, no longer light their Shabbat candles in specially designed hidden cabinets, and needless to say, they no longer celebrate Passover a month after the holiday was meant to be celebrated. This loss of the Pesach Sheni of the last Marranos makes me sad. Their Pesach sheni was a tribute to the commitment of their predecessors for their heritage, it was an artifact of God’s commitment to give second chances and it showed the radical ability we humans have to survive, persevere and to make believe that we can make believe. start of the Jewish month of Nissan. As part of the tradition meant to fool the spies of the Inquisition, they postpone the holiday until what Jews call “Pessah Sheni” – one month later. Therefore I knew that it was Passover for them now. I had the pleasure of viewing Amy Sillman: one lump or two, the current exhibit at ICA; THE INSTITUTE OF CONTEMPORARY ART/BOSTON. I was particularly intrigued by her Seating Charts. 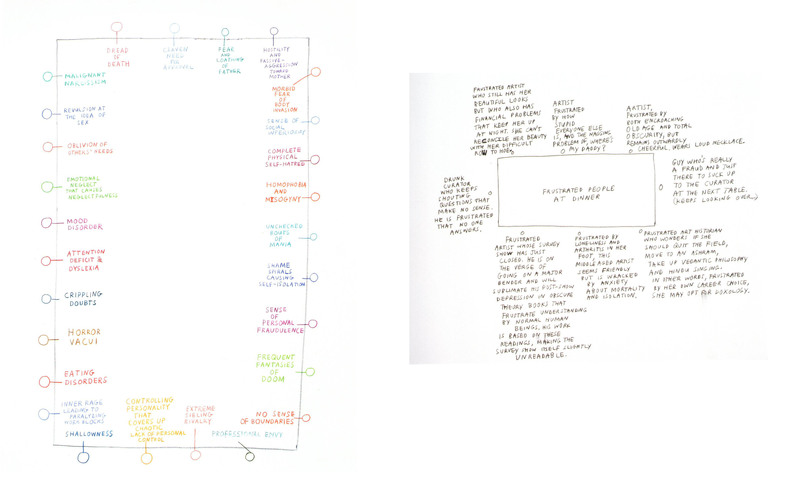 In the process of introducing us to her talents in gouache, watercolor, oil paint, and iPhone app, the show’s first two rooms contain several examples of an ongoing series called “Seating Charts.” Mordant excoriations of social life in New York’s art world, these text-heavy diagrams spell out the kinds of silent assessment we all instinctively make in the social arena. The humor is sharp. 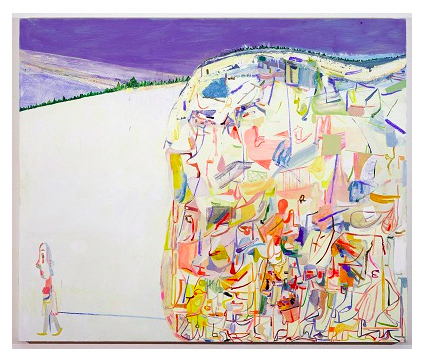 But it goes beyond humor into a kind of pathos that runs all through Sillman’s work: the pathos of being unable to transpose our own thought bubbles into social life; the fraudulent feeling of having to operate continuously in two registers. I am not the first to compare Jewish Law to dinnerware, in fact the preeminent code of Jewish law was called The Shulchan Aruch (Hebrew: שׁוּלחָן עָרוּך‎, literally: “Set Table”) authored in Safed by Sefardic scholar Yosef Karo in 1563. Ashkenazi Jews follow rulings of Moses Isserles whose glosses to the Shulchan Aruch are widely referred to as the mappah (literally: the “tablecloth”). 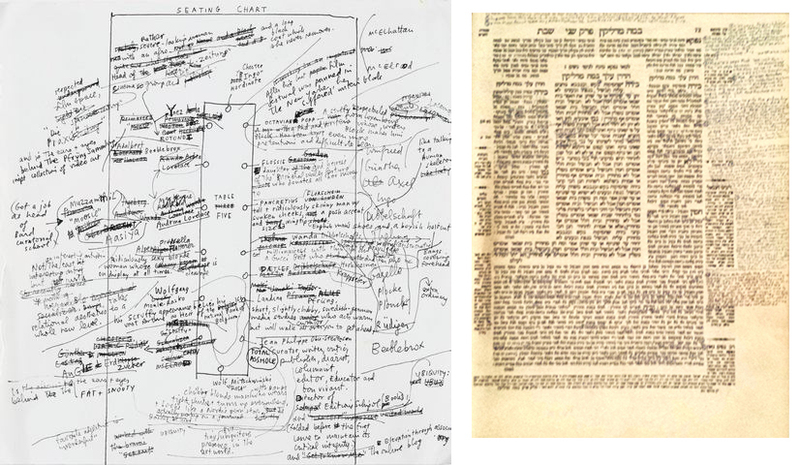 Commentaries on the work include Peri Chadash (“New Fruit”) and Megadim (“Dainty Fruit”) culminating in the early 20th century work Aruch HaShulchan (Hebrew: ערוך השולחן) (“the table is set”) which attempts to remaster the original recipes of the overly processed rulings of the Shulchan Arukh and identify their sources. With all the wonderful mixed metaphors of tables, fancy cloths and sweet fruits, there’s a bitter irony here. Remember: Jewish Law was to be a vibrant and dynamic oral law. It should come as no surprise that Karo himself had no very high opinion of his work, remarking that he had written it chiefly for “young students” (Shulchan Aruch, Introduction). Karo wrote the Shulchan Aruch for the benefit of those who did not possess the education necessary to understand the earlier works that included multiple rulings, opinions and ambiguity. We should be thankful that Karo had not lived to see the Sparknotes version of his work; The Kitzur Shulchan Aruch (Hebrew: קיצור שולחן ערוך, “The Abbreviated Shulchan Aruch“. If Amy doesn’t lunch with these choice specimens of social life in New York’s art world… What’s she going to draw about? If we don’t (hopefully) discuss the competing and contradictory texts and ideas of our religious and cultural heritage over the shabbat and holiday table …. What will become of us? Be honest… What are the alternatives? Schlepping our thought bubbles around with us on a ball and chain like a prisoner in solitary? note: Want to read madlik on parshat lech lecha? please click here: walking without pretext.